​It’s hard to understand maternal instinct. A mother’s natural ability to nurture, protect, and teach their young. A mare (mother horse) forms a unique bond with her foal (baby horse) as part of the birth process, and this bond remains strong no matter how many other mares and foals are nearby. They are protective, and will not allow any other horses to come near the foal. The mare provides sustenance and protection for the first six months, or so, of the foal’s life. During that time, she teaches her foal how to become independent and communicate with other horses. She will also teach her foal, how to watch, sniff, and listen, when presented situations that could propose danger. Hanover Shoe Farm, located in Hanover, Pennsylvania, has been breeding Standardbred horses since 1926. Each year, Hanover welcomes over three hundred foals into the world. With three veterinarians on staff and a twenty-four-hour foal-watch, Hanover mares and foals receive the best care. Sadly, most years there are a few foals that lose their mothers. An orphan foal raised by humans, often has social disabilities with both humans and other horses. When a Hanover Shoe Farm mares reach the point in her life when it’s time to stop having foals, due to age or physical conditions, she retires. At Hanover Shoe Farm, retired mares lives out their days in a rolling green pasture. Today, Hanover has over 100 retired Standardbred mares. However, there are a few mares that come out of retirement to raise and nurture orphaned foals. Mares that have shown their willingness to nurture other mare’s foals along with their own while in the herd, shows Handover Shoe Farm which mares could be a good foster mare. These are Hanover Shoe Farm’s super moms. Lilting Laughter is a twenty-seven-year-old mare that was born at Hanover Shoe Farm. She gave birth to seven foals of her own before retiring. Many of her foals have grown up to become harness racing champions. She is one of the best mares Hanover Shoe Farms ever had, but that’s not all. She loves being a mother. So much that she was “called in” during five different years, after she retired, to raise orphan foals. She never minded that these foals were not hers. She readily cared for the orphaned foals as if they were her own. 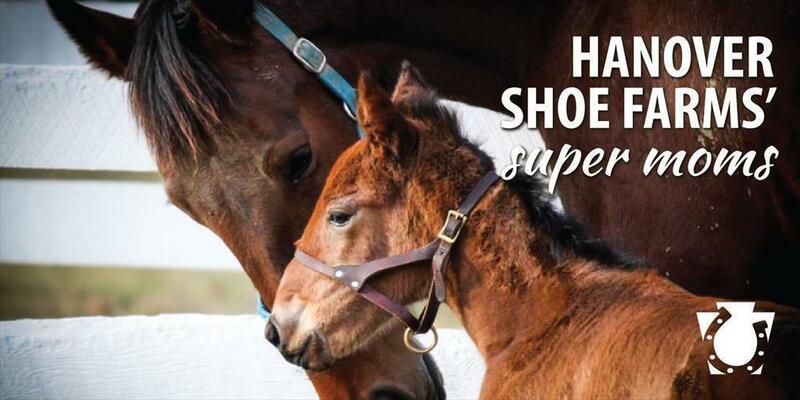 There is something special about Hanover Shoe Farm’s super moms, how they can naturally step in to raise an orphaned foal. No doubt, super mom Lilting Laughter has a special way she nurtures, protects, and teaches the foals she raises.